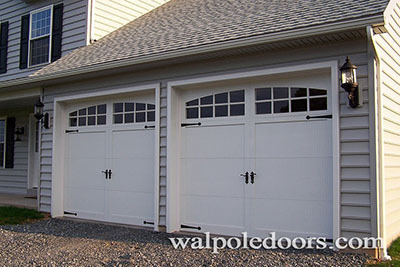 See the beautiful finished product of your garage door installation within one day or less when you choose Walpole Doors in East Walpole, Massachusetts. The first step is to have us out to your home for a consultation and estimate. We will walk you through various options ranging in color, style, and special features. Once we have decided on the product that works best for you, we take the necessary measurements and set a date to come back for the installation process. This can be within a few days or may take upwards of two weeks for custom orders. There are no limitations when it comes to choosing a garage door through us. We have access to all brands and have a number of suppliers, and also specialize in Haas™garage doors. Most of our products carry a lifetime warranty through the manufacturer, and we supplement that with a one-year warranty on our labor. We will install your new door correctly and stand behind our work.